Bitdefender or Trend Micro, which antivirus software is a better option in 2019? Read this comprehensive Bitdefender versus Trend Micro comparison to make an informed decision. In today’s world, you need to ensure your data and privacy are in safe hands. These days, we are putting more and more information on the internet, such as financial data, personal information, and digital photos, that make identity theft and similar digital crimes easier than ever. A recent statistic says there will be over 12 billion malware attacks in 2019, affecting millions of computers worldwide. It sounds stressful, but peace of mind is right around the corner with the right antivirus software. Rather than sticking with something that’s free and only offers minimal coverage, we recommend investing in sophisticated antivirus product – like Bitdefender Total Security 2019 – to get the very best protection and performance. If you don’t know where to start, you’re in luck. We put this guide together to test two well-known antivirus companies out there: Bitdefender and Trend Micro. We’ll look at what makes each unique and explain who we think is worth your money. In a rush? Take a look at our quick rundown for an easy glance at each category to see the winner. For more detail, simply scroll down to that section below. Winner: Bitdefender. Bitdefender offers a more robust feature-set to protect against malware attacks, whereas Trend Micro only offers standard features and utilities. Winner: Bitdefender. In independent tests, Bitdefender outscored Trend Micro by a small but meaningful difference. Winner: Bitdefender. This was a close call, but Bitdefender, again, outshined Trend Micro in terms of the impact on system performance. Winner: Both. Depending on your preference, you’ll like Bitdefender’s customization or Trend Micro’s simplicity more. Winner: Bitdefender. You get more bang for your buck from Bitdefender at almost every tier of coverage. Winner: Bitdefender. Consumeraffairs.org ranks Bitdefender as having better customer satisfaction than Trend Micro. Bitdefender offers more protection-related features and extra utility tools in its security suites than Trend Micro. Also, independent tests prove that Bitdefender is far better than Trend Micro in terms of both malware protection and the impact on system performance. While all antivirus software protect against malware, the biggest difference between any two given antivirus software the number of advanced protection-related features and tools they offer in their premium suites. Let’s look at the features offered by both Bitdefender and Trend Micro to see which is better. We will start with Bitdefender. Bitdefender Free Edition is the company’s Windows-only freemium antivirus software. Other than useful malware scanner, there’s isn’t much offered in this barebones free solution. It could be useful when you don’t have the money to pay for antivirus, but it pales in comparison to the paid offerings. Bitdefender Antivirus Plus 2019, which is also only compatible with PCs, is the company’s entry-level paid offering. It comes with a robust malware scanner that protects against all kinds of digital threats, a secure browser for safe shopping/banking needs, a limited VPN, and a password manager. Protection against ransomware attacks and fraudulent/malicious websites is also included in the suite. Next up is the more advanced Bitdefender Internet Security 2019. This is the middling paid package from Bitdefender, and it includes everything found in the “Plus” package, plus the File Vault utility (helps create encrypted drives on your computer where you can keep your sensitive data), the Vulnerability Checker (checks for outdated apps and other security holes in your system), and a webcam protector. A limited parental control module, which lets you monitor the surfing habits of your children and bar certain websites from being accessed, is also part of this suite. 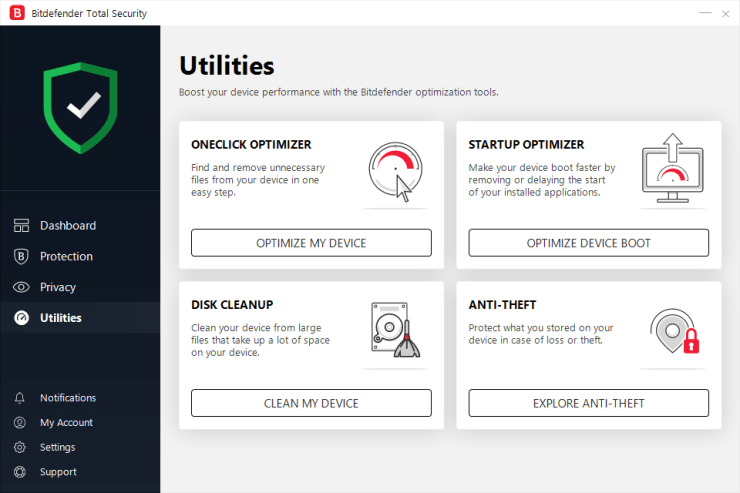 Another level up is Bitdefender Total Security 2019, which is compatible with PCs, Macs, Android, and iOS. It’s the company’s most popular security package and comes with everything that both previous suites offer, plus an anti-theft module; this can let you locate any devices that have Total Security installed, even if they’re lost or stolen. The suite also has a super optimizer that improves your computer’s performance based on its hardware and software makeup. This suite allows you to protect five devices in any combination with a single subscription. Out of all the high-end suites we have reviewed this year, Bitdefender Total Security represent the most bang for your buck. However, if you have a large family, you should consider Bitdefender Family Pack 2019 instead. A single license of this suite allows you to install the “Total Security” suite on all of your devices. If you are just looking for Mac-specific security package, check out Bitdefender Antivirus for Mac. It boasts an excellent malware scanner, along with few other useful utilities. If you’re looking for business protection, Bitdefender offers a range of business products for different needs. Click here to compare all of them in detail. Now, let’s see what Trend Micro brings to the table. The company’s first paid offering is Trend Micro Antivirus+ Security. It comes with a malware scanner (we’ll see how effective it is in the next section), an email filter (blocks spam or junk emails), and web protection. The Pay Guard module, which is a secure browser for all online payments, is also part of the package. Like most modern antivirus software, it regularly receives new definitions to provide immediate protection against emerging threats. A single license of this plan protects one PC. The next tier of coverage is Trend Micro Internet Security, which is another PC-only package. It has everything found in the first suite, along with parental controls and several system optimization features. This suite lets you protect up to 3 PCs with a single license. 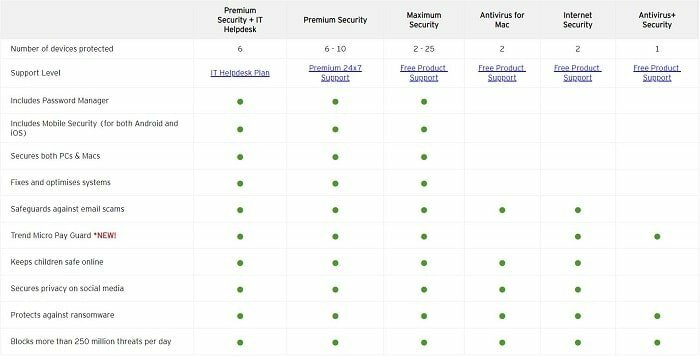 Finally, Trend Micro Maximum Security is the company’s top-drawer premium coverage. This package is compatible with PC, Mac, Android, and iOS devices. It includes everything that’s part of the previous two packages, plus a full-blown password manager. This suite protects up to 5 devices. If you’re interested in the business products offered by Trend Micro, visit this link for more information. Both Bitdefender and Trend Micro offer 24/7 customer support to premium customers through a variety of channels. Winner: Bitdefender. Overall, Bitdefender wins this round of comparison as it offers more features/utilities in its premium suites than Trend Micro. Most modern antivirus software possess exceptional malware protection capabilities. To defend against malware means that a software must defend against all kinds of threats, like ransomware, worms, spyware, rootkits, and other related threats. 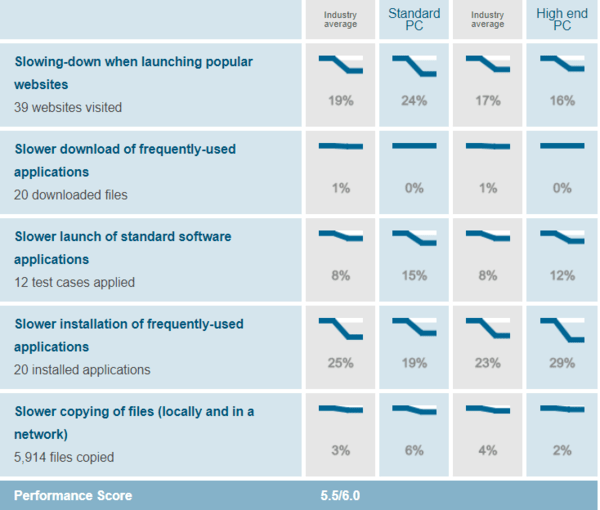 How can you tell which software is better at protecting against malware? Well, you can find recent independent lab tests from unbiased organizations that comprehensively examine the performance of various top antivirus software. There are two primary testing companies we will look at are AV-Test and AV-Comparatives. Germany’s AV-test uses a testing rubric of 1 to 6 with 6 being the highest score. In tests conducted in November-December 2018. 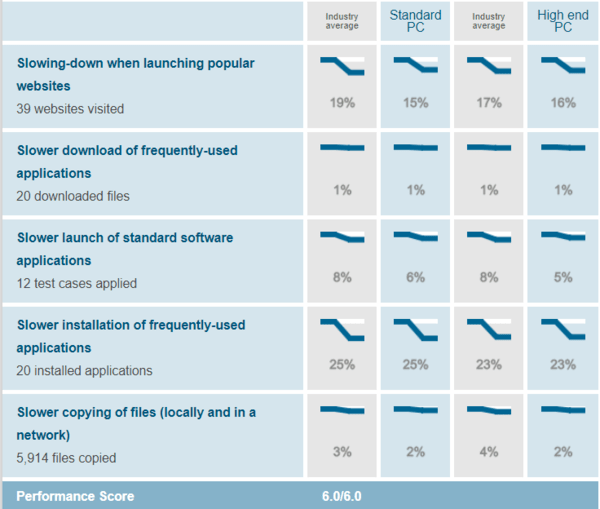 Bitdefender scored a perfect 6 out of 6, which shows that its malware protection capability is excellent. Trend Micro also came up with perfect scores and got a full 6/6 rating. Austrian lab AV-comparatives is another antivirus testing laboratory that conducts several exhaustive tests to determine how well a security product defends against malware infections. In their recent Real-World Protection Test, Bitdefender got the highest possible award given out by this company, the ADVANCED+ award, because of its excellent protection rate with few false positives. ***False positive is an event when a security software falsely flags a clean file or URL as malicious. Trend Micro was given the second-best ADVANCED award from the experts at AV-Comparatives. Winner: Bitdefender. Overall, independent tests prove that while Trend Micro is competitive and capable, it is slightly behind Bitdefender in terms of malware protection. Malware protection is one thing, but antivirus isn’t worth anything if it slows your computer down so much that you can’t enjoy using it. Performance is arguably just as important a factor to consider when you’re shopping for antivirus software. Thankfully, both testing organizations also conduct comprehensive tests to measure the impact of each software on your computer. In the recent performance evaluations conducted by AV-Test, Bitdefender scored a 6 out of 6 in the Performance. Trend Micro got a slightly lower but still reasonably good 5.5/6 rating. AV-comparatives has its own test to showcase results. 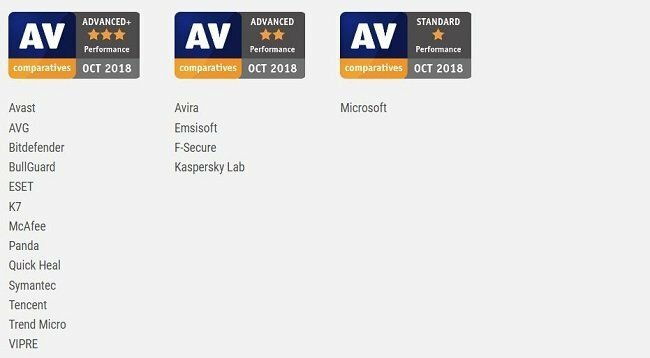 Bitdefender maintained its ADVANCED+ award in the Performance Test, which was conducted in October 2018, while Trend Micro showed itself to be Bitdefender’s equal in this test, with the ADVANCED+ award of its own. Winner: Bitdefender. It’s a close call, but since Bitdefender edged out ahead of Trend Micro in AV-Test evaluations, we have to give this category to them. Now that we’ve looked at the digital nuts and bolts of both antivirus software’s, it’s time to take the human element into consideration. First, let’s examine Bitdefender’s interface. Bitdefender’s user interface is thematically tied together with customization and specialization. There are specific “quick actions” which can be programmed and dragged around into different spots according to your individual preferences, which is very useful. You can combine tiles and group actions into profiles which allow you to tailor your Bitdefender interface into something truly unique. In this way, you can prioritize daily or weekly activities and scanning schedules beyond that which was foreseen by the developers. This can be quite handy if you have a complicated routine or are trying to optimize your computer in a particular way. In a sense, computer experts or those comfortable on a keyboard will appreciate Bitdefender’s interface more than an office. This isn’t to say that Bitdefender’s interface is complicated, but to say that much of its value can only be reached by using it to its full capability. Bitdefender also offers a useful “auto-pilot” feature which applies all the standard settings with one click. Now let’s look at Trend Micro’s user interface. 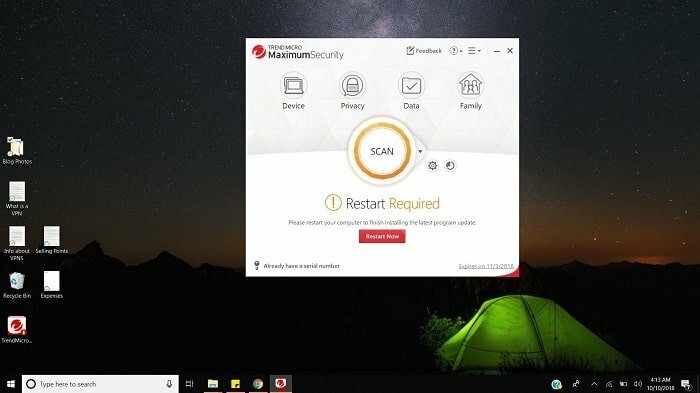 In opposition to Bitdefender’s customizable interface, Trend Micro offers a dashboard that is simplistic and intuitive. Everything is easy to see and understand, and a quick glance at the screen can help you understand the health and status of your computer. There aren’t customization options or setting changes allowed with their interface, but if you’re not very computer literate or you don’t care about customizing your experience, you may like this aspect. It is extremely easy to understand what you need to do next with your computer with Trend Micro’s interface, particularly if you didn’t already know what needed to be done from week to week. Winner: Both. We think this category is a tie. Those who want more customization and to get into the nitty-gritty of their system will appreciate Bitdefender’s interface, while those who prefer simplicity will love Trend Micro’s. All the categories we considered above are important, but pricing will make or break the decision for some people. Affordability is an important factor. Bitdefender Free costs nothing, keeping to its name. It is reflected in the overall value you get from this package, which is minimal. Bitdefender Antivirus Plus is the first paid product, and it costs $34.99 per year for three PCs. Bitdefender Internet Security protects three PCs for $39.98 per year. This is a few dollars increase for a greater variety in features and additional perks, including parental controls. Finally, Bitdefender Total Security, which is our recommended suite for 2019, represents great value for money; it protects up to five devices for just $44.99 per year. For families, Bitdefender Family Pack is a great option. It will protect all your household devices (including Macs and smartphones) for just $69.98 per year. Let’s see how much Trend Micro’s products cost. Their lowest coverage packages, Trend Micro Antivirus Plus costs $29.95 per year for just one PC. Trend Micro Internet Security, their middling tier, protects 3 PCs for $39.95 per year. There final tier of coverage, Trend Micro Maximum Security, which protects 10 devices (Macs, PCs, or mobile devices) for $49.95 per year. Winner: Bitdefender. As you can see, Bitdefender is more economical early on, while the two companies even out as you get higher towards the premium packages. But overall, Bitdefender wins this category as it offers more bang for your buck. There’s one more aspect we can consider in our search for the best antivirus. How customers perceive a company can often give us insight as to that company’s overall value. One place we can check is Consumeraffairs.org. The site collects customer feedback and converts it into a five-star score. 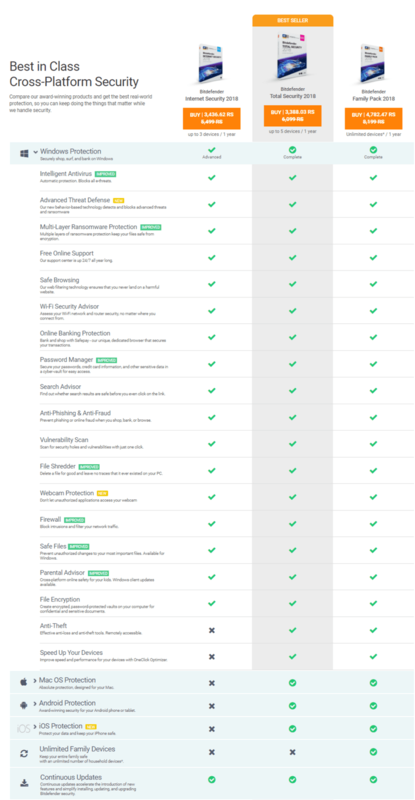 Bitdefender has four out of five stars on the site, showing general customer satisfaction, while Trend Micro only has two stars, indicating higher customer dissatisfaction. The Better Business Bureau is another place we can look for customer feedback. Bitdefender has a C rating from the BBB, which is only average and not that impressive. Trend Micro does not yet have enough complaints to be registered with the BBB. Winner: Bitdefender. Overall, given that the only real metric we have for consumer happiness gives the edge to Bitdefender, we think that this category goes to them. It may be that Trend Micro eventually outshines them, but not for now. There’s no doubt that Trend Micro offers valuable antivirus products, but Bitdefender came out on top in almost all the categories we considered.